My Dessert Choice Is ALWAYS Chocolate! Usually if there will be lots of folks in attendance and I want to make sure I get some… I mean I want to make sure that everyone has a chance to enjoy brownies, I’ll double the recipe to make a large 9×13 pan of them. But today I should be safe with an 8×8 pan. I brought out my ingredients – vegetable oil, butter, sugar, vanilla, eggs, flour, cocoa powder, baking powder, salt and chopped pecans. I preheated the oven to 350 degrees and greased my 8×8 pan. Then in a medium bowl I mix together the oil, butter, sugar and vanilla. I beat in the eggs and set the bowl aside. In my KitchenAid mixer I combine flour, cocoa, baking powder and salt and allow the mixer to thoroughly blend the ingredients. Then I gradually stir the flour mixture into the egg mixture just until blended. Finally I stir in the chopped pecans. My mama taught me to share, so of course I’ll share the brownie recipe with you! Preheat oven to 350 degrees F. (325 degrees F for glass pans) Grease an 8x8 inch baking pan. In a medium bowl, mix together the oil, butter, sugar, and vanilla. Beat in eggs. In separate bowl combine flour, cocoa, baking powder, and salt; When fully combined, gradually stir flour mixture into the egg mixture just until blended. Stir in nuts, if desired. Spread the batter evenly into the prepared pan. Bake for 20 to 25 minutes, or until the brownie begins to pull away from edges of the pan. Let pan of brownies cool on a wire rack before cutting into squares as brownies will be very soft while hot. You can serve directly from the baking dish. Delicious! And with homemade brownies there’s the added bonus of having no questionable hard-to-pronounce ingredients, it costs only a fraction of the price of buying a pre-made mix and there’s precious little trash making its way to a landfill to satisfy my choco-craving. Go ahead & give ’em a try, you’ll be amazed! 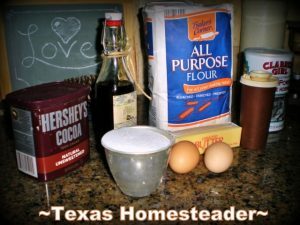 This entry was posted in Blog Posts and tagged Cooking, Make-It-Yourself, Recipes on April 11, 2014 by Texas Homesteader. 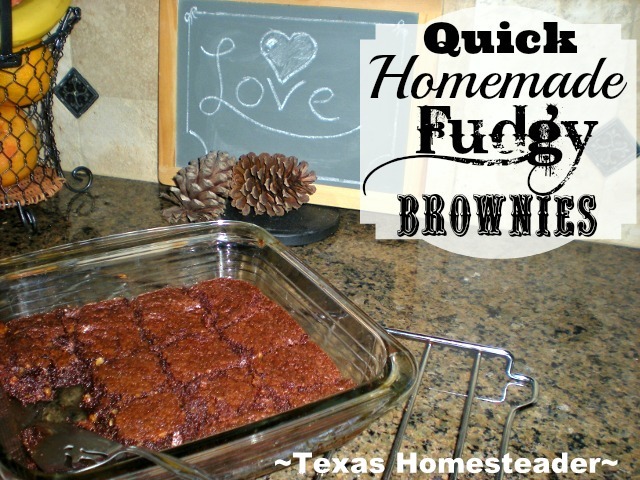 I made your brownies and they were a hit with my grown kids, grandkids and husband! So simple and so good! Thanks for sharing! I discovered this recipe on Carol Pagan’s Blog. Sane Superwoman Club. Carole writes about making life easier, taking care of ourselves, eating healthily and keeping it all together at home. Carole mentioned she made your Brownies for Easter, I tried the recipe and my whole family liked them so much. Your recipe is a keeper. Thank you so much, and I am now following you on Pinterest! Yum!!! These look so good and easy to make. I will definitely give these a try. Yummy! Thank you for linking up with Idea Box! Yumminess in a pan! Thanks for sharing your recipe, and your secret to pulling them out of the oven at just the right time. I am convinced this is what makes them so awesome! Pingback: Failed Fences, GOOD NEIGHBORS! Yum! I’m not ashamed to admit I’m a chocoholic too 🙂 I don’t see anything wrong with it if everyone gets at least one piece, right? Thanks for sharing on Merry Monday. Nothing I love more than chocolate! Love your link! Thanks for partying with us on the Four Seasons Blog Hop! Sandra from Scrumptilicious 4 You! So what you’re saying is you have to be patient… We’re talking chocolate here. 🙂 Thanks for the great advice and the recipe. Confirmed chocoholic here too! I love that this recipe is simple in its ingredients. I will definitely give it a try! Say?… Is there a secret of how not to undercook or overcook brownies so that they are moist but not gooey? These look great I might have to bless my kids with some this afternoon. I just found your blog and wanted to say thanks for all the inspiration.